METAIRIE, La. 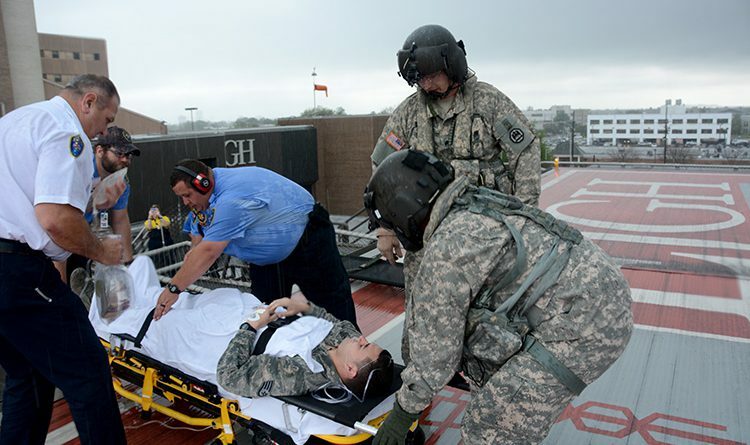 – The Louisiana National Guard and the East Jefferson General Hospital practiced an aeromedical evacuation using role players acting as patients as part of the Vigilant Guard 2016 exercise in Metairie, April 15. Vigilant Guard is a federally funded exercise to prepare for all-hazards response and emergency operations. The exercise scenario tested the LANG’s response to a simulated Category 3 hurricane that made landfall on the Louisiana coast, and was practiced in coordination with the Louisiana Governor’s Office of Homeland Security and Emergency Preparedness’ statewide exercise. 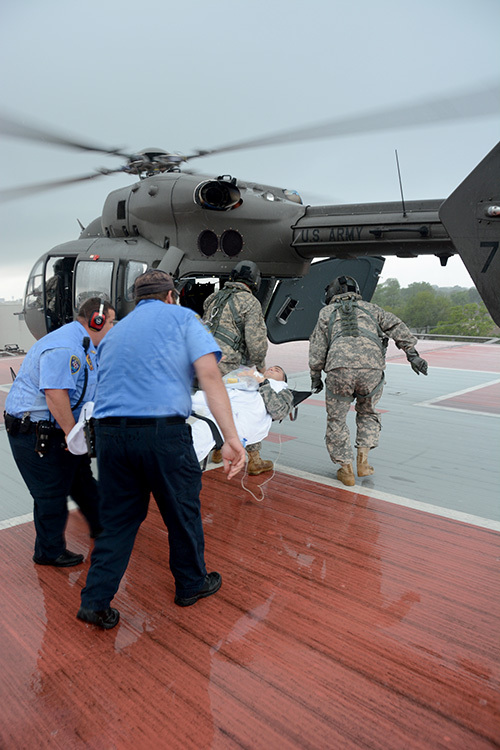 The role players, from the Louisiana Air National Guard’s 159th Medical Group, were transported by a LANG UH-60 Blackhawk flown by a crew from the 1st Helicopter Assault Battalion, 244th Aviation Regiment, and a UH-72A Lakota flow by 2nd Battalion, 151st Aviation Regiment, from EJGH in Metairie to Naval Air Station Joint Reserve Base New Orleans in Belle Chasse. Guillot said that such an evacuation would likely occur should a real disaster knock the hospital’s electricity out and cause widespread equipment failure. “This kind of exercise is important so that everyone who needs to know what to do will know what to do as smoothly and efficiently as possible,” said Christine Bass, Guillot’s administrative assistant. 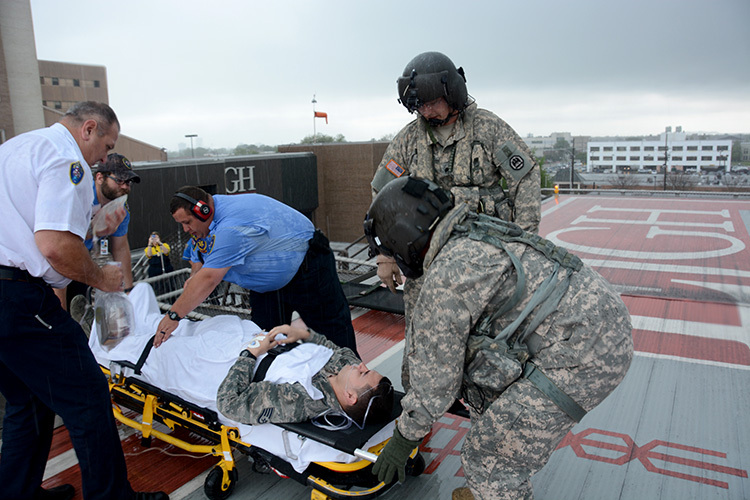 In addition to the role-players transported from EJGH, more than 270 role-player patients were processed through the aeromedical marshalling point and loaded onto a C-17 Globemaster III at NASJRB – New Orleans. 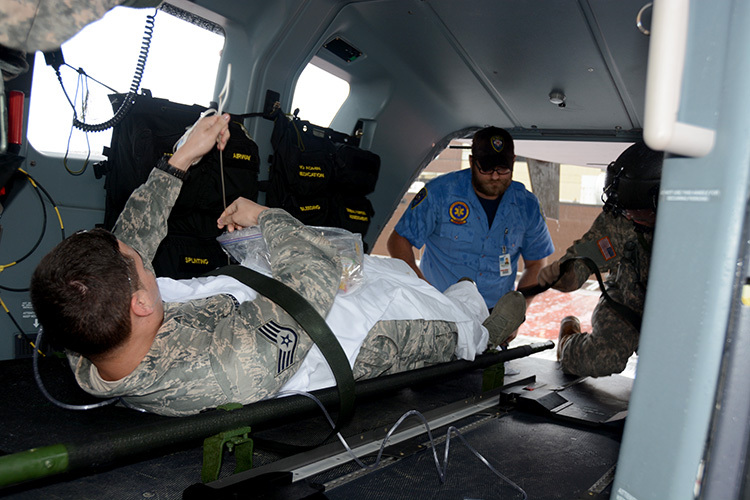 During an actual emergency, the patients would then be transported to hospitals outside of the threat zone for medical care. “Once the patients get to Belle Chasse, they’ll triage them just to make sure it’s okay for them to get processed to the nearest hospital available,” said Capt. Angela Orr, a nurse with the 159th Medical Group. 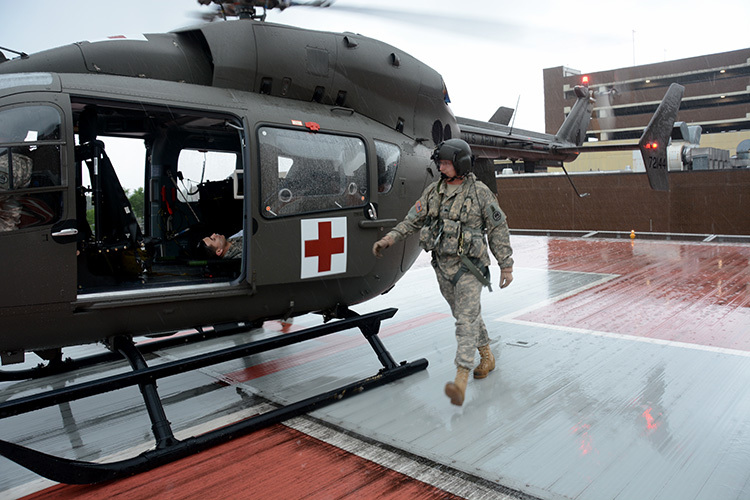 The 167th Airlift Wing from Martinsburg, West Virginia and the 137th Special Operations Wing from Oklahoma City, Oklahoma also participated in the exercise. Vigilant Guard, a federally funded exercise that is supported by the National Guard Bureau and sponsored by the United States Northern Command, whose mission is to provide homeland defense, civil support and security cooperation to defend and secure the United States and its interests.